A Yellow Springs Blog: Bench to Nowhere: It's back! I DO hope this isn't serious. The allergy problems in this building are AWFUL; when doing the YSHS musicals, we always had problems with students due to the foundry dust. Best thing for this building is to gut it and start over! 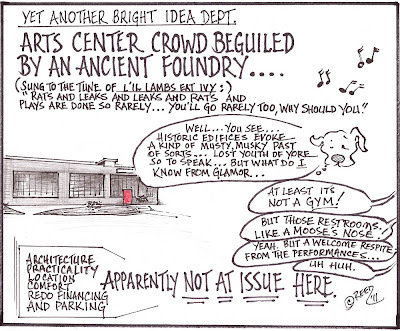 Great cartoon commentary on the terrible idea to use this space as the main stage for the arts center in YS! Way too much asbestos, mold, dust, mice (and droppings) to make it an appealing place. When it rained huge sheets of water would come pouring inside from holes in the roof. No one bothered to clean up, the pools of water would take days to evaporate. That explained the thick smell of mold.